Keeping warehouse workers safe requires more than just helmets and goggles. Projected safety signage is one of the most important components of a safe work environment, outperforming tape, paint or adhesive labels. Here’s how to effectively project safety signage throughout your warehouse or industrial space to ensure the safety of you and your crew, even in the most high-impact work environments. Click to See Enlarged Safety Signage Infographic. Warehouses often use tape, paint, and adhesive safety labels for safety signage, but machinery grease can obscure the paint or labels and everyday wear and tear eventually causes the signs to fade. Poor lighting conditions make it especially hard for workers to see the fading signage. This requires repeated expenditures for repainting or re-marking, and poor signage increases the risk of injury to a worker or visitor. The most effective way to ensure signage is never overlooked is by projecting the image with a gobo and gobo projector. 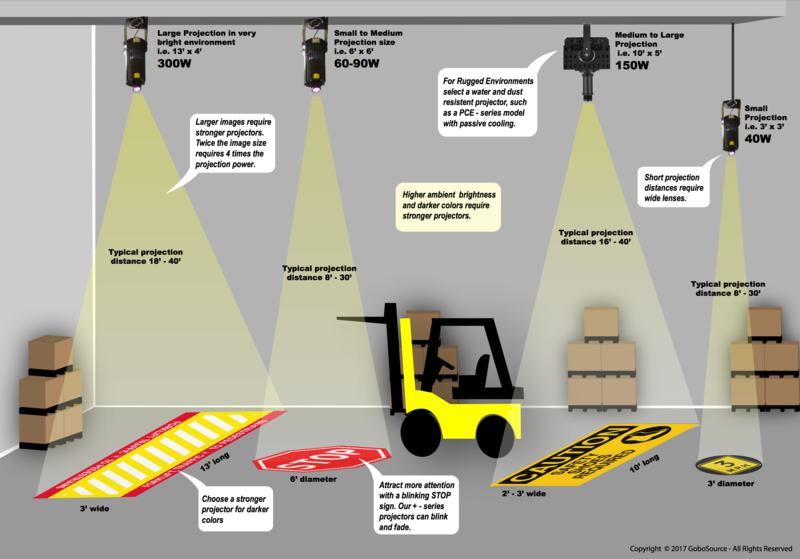 Projected safety signage has a longer lifetime than other forms of signage making it more cost effective and reliable. Instead of constantly replacing old signage, projected signage only requires a gobo projector and a gobo to reflect the desired image, from bright red stop signs to crosswalks. When projecting safety signage there are a few things to consider to ensure your signs are highly visible in your particular environment. The first place to start is choosing the right projector and lens combo. When selecting a projector and lens, the desired projection size is the most important factor because it greatly affects the required wattage and the projection distance. In bright industrial environments, our ECO Spot projectors typically range in projection size from 3 to 13-feet. You’ll see in the table below, that each time you increase the image size, it also significantly increases the amount of projected light required. The sizes above are typical for safety signage such as stop signs (3 to 6ft in diameter) and crosswalks (10x3ft). A single projector can typically cover projection sizes up to 13x4ft. Wider projection sizes require multiple projectors that each project a part of the image. See our list of recommended safety signage projectors. When choosing a lens, take into account both your projection distance and desired image size. Usually, the longer the distance, the larger your image size but there are ways around this if you choose the right lens. A wide lens, for example, can project a large image at a shorter distance whereas a narrow lens works well for longer distances and smaller images. We recommend a distance between 10 and 40ft: 10-20ft for small projections, like stop signs, and 20+ft for large projections, like crosswalks. Your projection angle also comes into play. Ideally, you should place your projector exactly perpendicular to the center of the projection. This prevents keystone distortion, a term that refers to the increased distortion of an image, the steeper your projection angle becomes. If you do have to project at an angle, first try to decrease the angle as much as possible. Sometimes you can achieve this by mounting your projector at a higher level, like on the ceiling of your warehouse. If your only option is to project from below at a non-perpendicular angle, the larger the projection distance, the better. This flattens out the angle of projection, preventing keystone distortion. Safety signage should be projected in bold and eye-catching colors like yellow and red. These kinds of dark, saturated colors, however, only reflect about 5% of the projected light. This means they will be hard to see if projected onto a dark surface. To generate contrast and improve visibility, choose a wall or floor space that is as light as possible; white surfaces work best. Light to dark grey surfaces can also work, but keep in mind that darker surfaces require stronger projectors. The clarity of your projected safety signage also depends on the amount of ambient light it has to compete with (such as overhead artificial lighting or natural light from a window or skylight). We recommend investing in an inexpensive light meter to measure the brightness of your projection surface. On average, the brightness of warehouse floors is about 10-25fc and 20-35fc for production floors. We recommend a projection brightness of three times the ambient light level on the projection surface. Industrial settings are often humid and/or dusty which can have several effects on a gobo. Indoor projector models expose the gobo to airflow, allowing dirt to accumulate on the gobo and lens, obscuring the image. Exposure to humidity can also shorten the gobo’s lifespan. In dusty environments, the cooling fans on an indoor projector will also need to be cleaned regularly. Outdoor projectors, on the other hand, provide more protection for the gobo and lens but often still have a fan that requires regular upkeep. The best option for industrial safety signage is our new fanless projector line because it has no moving parts and utilizes a passive cooling system, making it ideal for humid, dusty environments. We now have a full lineup with 60, 90, 150, and 300W. Sometimes, even if you properly implement all the tips above, a large, boldly-colored image still isn’t enough. To ensure workers don’t overlook signs that always remain on, a motion sensor, blinking or rotation feature may be necessary to prevent accidents and reduce worker injury. You can also set your projection to blink continuously, grabbing the attention of workers and visitors alike. Industrial safety signage projection can greatly increase the safety of your work environment and is more cost-effective than traditional signage. If you have questions about how to implement projected safety signage in your warehouse, call us at 1-831-431-8801 or visit our Projected Safety Signage page. Posted on May 31, 2017 by gobosour. This entry was posted in Corporate and tagged ECO Spot projectors, gobo projector, industrial safety signage, safety signage, warehouse safety. Bookmark the permalink.